I love her fro! SO adorable. The picture of you holding & praying for her...eyes full of tears! Have you noticed how much Keemberlie looks like you? In the picture titled "Me and my pretty girl," your mouths, smiles, cheeks, and forehead/eyebrows are very similar. Praying for her to come home to her awaiting family soon! How awesome that you got to visit your Princess Keemberlie again! Such sweet pictures and memories to fill your hearts. 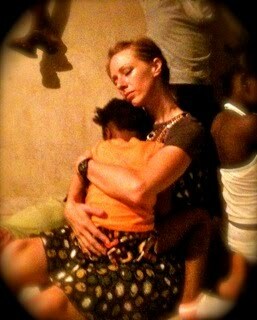 Praying that this adoption would be expediated and that Keemberlie would be able to come home soon. How hard to say good bye when you want to just take them with you. Praying God's love and security over Keemberlie and your family and grace for the waitng and trusting time. When we don't know why it's taking so long, we trust and cast our cares on God who sees and knows and is always working. Loved reading about your time with Keemberlie. Praying that you will be able to bring her home soon! You are one strong woman to be able to say bye to your little girl. I love all these pics. You are making her so happy, Cindy. I can't wait to meet her too. Came for the song...stayed for the story. Thank you for sharing your journey. I am weeping for you & Keembrerlie... and yet, sharing in your joy. Thank you for letting God speak through your beautiful life.